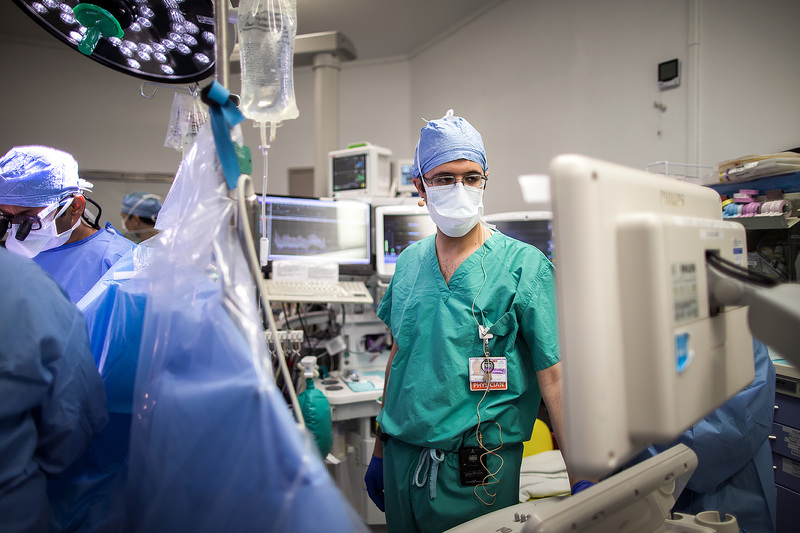 Dr. Menachem Weiner, Director of Cardiac Anesthesia, monitors patient vitals during a mitral valve repair operation. Your experience with us will begin when you come in for preoperative testing. Here you will be greeted by one of the physicians from the Division of Cardiothoracic Anesthesiology of the Department of Anesthesiology, Perioperative and Pain Medicine. In a private consultation room, your past and present medical history will be discussed. Afterwards, they will review with you how the anesthesia will be managed in your specific case and discuss what you need to do to prepare yourself the evening before surgery. Please feel free to ask any and all questions that you may have regarding your care. As everyone’s situation is unique, we encourage you to discuss with your anesthesiologist or your surgeon any concerns that are not covered here. On the morning of surgery, after you have gone through the preadmission department, you will be brought to the preoperative holding area. At this time, you will be introduced to the anesthesiologists who will be responsible for your care. Once again your medical history will be reviewed as well as the plan for anesthesia. Any and all questions you may have will be thoroughly addressed at this time. Prior to entering the operating room an intravenous line will be started and a mild sedative may be given. During your mitral valve repair you will be given general anesthesia. Your condition will be carefully monitored, controlled, and treated by your anesthesiologist, who uses sophisticated equipment to track the ways your body is responding. You will be unconscious and have no awareness or other sensations during this period. The duration and level of anesthesia is calculated and constantly adjusted with great precision. A breathing tube will be inserted through your mouth to maintain proper breathing. A large intravenous line will be carefully placed in one of the large veins in your neck. At the conclusion of surgery, your anesthesiologist will reverse the process, and you will be brought to our Cardiothoracic Surgical Intensive Care Unit where you will regain awareness. While in the ICU, you will be cared for by physicians specialized in the critical care and by our dedicated nursing staff until the time you are transferred to your hospital room. Family members can come to visit you approximately 20 minutes after your arrival in the ICU. Prior to your procedure, you must have an empty stomach to minimize the chances of regurgitating any undigested food or liquids. Anesthetics suspend the normal reflexes that prevent food and drinks from entering your lungs, so for your safety, you will be told to fast (take no food or liquids) for 8 hours before surgery. In addition, the anesthesiologist may instruct you to take certain medications with a little water during your fasting time. For your own safety, it is very important that you follow these instructions carefully; if not, it may be necessary to postpone surgery. Cigarettes and alcohol affect your body just as strongly and sometimes more so, then any of the medically prescribed drugs you may be taking. Because of their effects on your lungs, heart, liver, and blood, to name a few, cigarettes and/or alcohol can change the way an anesthetic will work during surgery. It is thus crucial to let your anesthesiologist know about your consumption of these substances, and also to mention any over-the-counter medications or herbal/holistic medicines you have been taking. This is equally important for so-called street drugs, such as marijuana, cocaine, amphetamines, and the like. People are sometimes reluctant to discuss these things, but it is worth remembering that such discussions are entirely confidential, and that various privacy laws protect whatever your doctor writes about them in the medical record. Your anesthesiologist’s only interest in these subjects is in learning enough about your physical condition to provide you with the safest anesthesia possible. So, in this case, honesty is definitely the best policy, and the safest one. All operations and all types of anesthesia entail some risks, which depend on many factors, including the type of surgery and your medical condition. Your anesthesiologist takes multiple precautions to prevent complications and fortunately, adverse events are very rare. You should speak to your anesthesiologist if there are any issues that you are particularly concerned about. Please feel free to direct any questions or express any of your concerns to your anesthesiologist ahead of time. We want to make your surgical and anesthetic experience as safe and pleasant as possible.